Escribà's Rambla shop is located right next to la Boqueria market entrance. I was sure it was a busy place given its location and popularity, so it would have been wiser to come there early in the morning. However the best I was able to achieve that morning was 11 a.m. and, yes, it was busy. The first thing that catched an eye was the main glass vitrine displaying picture perfect tarts and gateaux, which seemed to be mostly inspired by French tradition. However I knew it was not what we came for. The vitrine displaying Spanish pastry pieces I was after is built into one of the shop's windows and is on the right, from the entrance. While I was studying it and trying to pick sweets to try, my mom managed to catch a table for us. That was lucky - I would never accomplish these two things successfully at once. Croissants in general seem to be popular in Barcelona. Escribà is quite famous for its croissants - flavored croissants, not plain. It offers quite some choice of them - this I realized when we got seated at a tiny tall round table (not more than 40 cm in diameter) and got the menu. We picked a croissant with "vanilla y rosa". 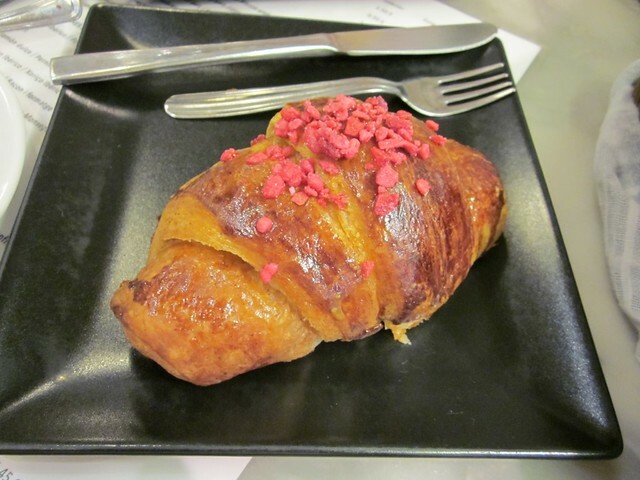 It was a very well made croissant with mild aroma, filled with red berry jam. Cremadet instantly caught my eye on the display, though I never red or heard about it before. It was impossible to pass by, so we got one. Even now I haven't managed to find it's description somewhere. It was a crisp (perhaps fried) piece of pastry filled with all time crema catalana and caramelized on the outside. It was crazy delicious and we soon realized that we had to get the second one. Both disappeared instantly together with our cups of cappuccino. The rest we had to leave for the next visit and it was tough, because Escribà has way more to try. Even if we leave aside the croissant variations. 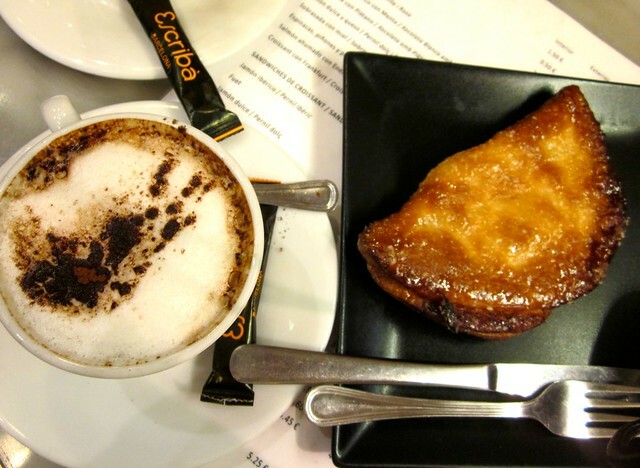 Ensaïmada is another piece of pastry, which is traditional for the region and is definitely worth attention. It comes from Majorca and represents a soft and sweet roll, plain or sometimes filled with jam, sometimes dusted with icing sugar and sometimes caramelized. We tried it in several other pastry shops and I can say I do like it a lot. The "coca" is a whole family of pastries which has its sweet and savory variations. Sometimes it is flat and the filling (e.g. slices of vegetables, cheese, sausages) is on top, so it resembles pizza. The sweet version in Escribà looked closer to a cake. Interestingly, it was sold by weight, not by item. This was when we had to leave and travel to park Güell. Yes, we are not eating only on our trips. Though you are right. Almost only.